I have been quite on the Blog front since starting a few commissions but this weekend I found the time to start a mini painting! It’s part of a Self-Portrait Project being hosted by the Art House Co-op in Brooklyn, New York. Proceeds will be going towards their Free 10 x 10 Community Art Workshops. This Friday, they sent me a 4×4 inch canvas with instructions of painting a self-portrait using any medium and it must be post marked by May 15th. Step One: What is the painting for? 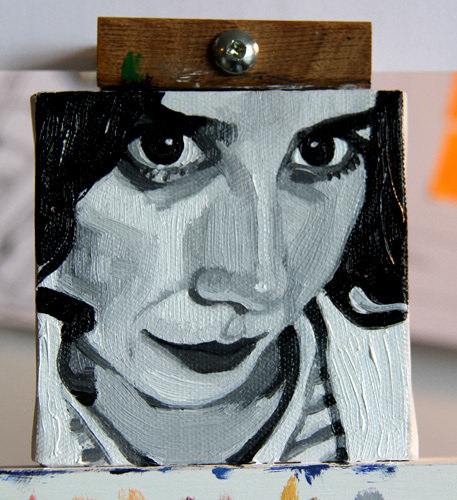 As mentioned above, it’s a self-portrait with the restriction of using a 4×4 inch canvas. Step Two: Find an image. I started taking a few photos of myself beside a window. I liked the look of the bright natural light on my face with my hair casting interesting shadows BUT I wasn’t being very successful at taking a good photo. So, I finally decided to just scroll through my Facebook profile pics to see if any fit the bill. Success! I found an image that I really liked and thought it would be fun to paint. 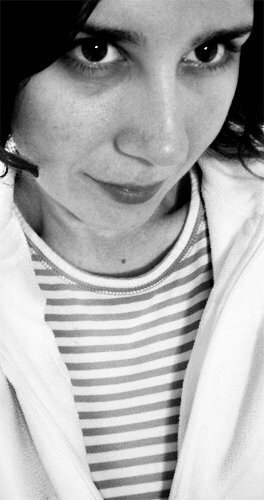 Yes, it’s black and white. My work and I am not generally known for being sans colour but I thought this would be a nice contrast especially since I plan on painting the edges in colour. Step Three: Crop and Adjust image. 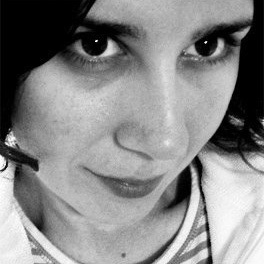 The original image from my profile page was more rectangular, so I definitely had to crop it. I didn’t play around with the levels at all since I thought they looked okay. Step Four. Prep the painting surface. Since the canvas was sent to me already primed I didn’t have to do anything with it. Yay! I was able to move on to Step Five! Step Five. Print out reference imagery and add grid lines. After cropping the image I printed two, full size images onto regular printer paper. I decided to use the Grid Transfer Method since the image itself is complex and I wanted to make sure that the facial proportions were correct. This will save me time when I start to paint because I won’t have to drastically change the shapes. Step Six. Transfer image onto painting surface. Transferring the image didn’t take very long. There maybe small areas that need tweaking, if so I will do that with paint. Once I start adding paint I will then begin to see mistakes more clearly. Already, after posting these images I can see a few areas that need to be worked on. Can you spot them? Step Seven. Colour Wash. I decided to opt out of a colour wash and just go straight into painting. Why? I figured since I would be painting in grays, having a little gray bleed out from the graphite wasn’t a big deal. Step Eight. Paint. I started painting, using a mixture of Ultramarine Blue, Van Dyke Brown and Zinc white to create a nice shade of gray. For areas that I want to be white, I am using Titanium White. I can use it in a pure form or mix it with a dab of the Ultramarine Blue and Van Dyke Brown mixture. I really enjoy seeing the paint. So, for this painting I’m going to make sure that I have interesting areas of texture. The really dark areas, like the hair will have thickly applied paint. The white areas will also follow suit. It is for that reason I have started this portrait amidst my commissions because I need to have adequate drying time for the Titanium White. Fingers crossed that it is dry before the May 15th deadline! Step Eight. Continue painting. 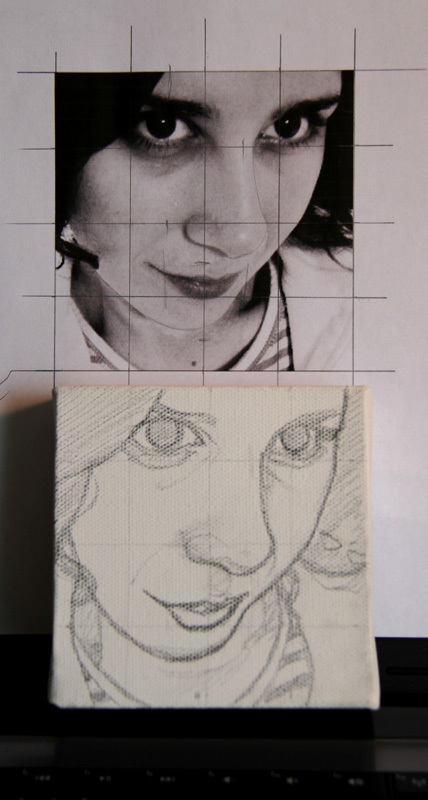 Next I will work on the eyes and play with enhancing the forms by using highlights and mid-tones.